How Often Should I Do Push-Ups? The push-up might be the most well-known exercise on the planet. As a measure of physical fitness, it's used by everyone from middle school gym teachers to drill sergeants. If you're looking to build strength, adding a push-up routine to your workout plan is a good move -- but too much of a good thing might be just as bad as no exercise at all. The simple push-up has long been used as a metric of strength since it relies on muscle groups throughout your body for perfect execution. "It takes strength to do them, and it takes endurance to do a lot of them," said TV fitness pioneer Jack LaLanne, in an interview for the New York Times. Push-ups task your arms, legs, chest, shoulders and core, and are a fundamental representation of your overall health. How often you should incorporate push-ups into your workout depends on your overall level of fitness. Fitness tests are a common occurrence in public schools. If you're looking for a baseline level of fitness to shoot for as a push-up goal, a fitness test scores you based on the number of push-ups you're able to complete. Fitness tests, as published by the Washington Post, rate the number of continuous push-ups you're able to do by your age group, and on a scale from Excellent to Poor. Everyone's physiology is different, but these numbers offer an approximation for you to shoot for when you're doing push-ups. It is possible to do push-ups too often, says John Fenlin, an orthopedic surgeon at the Rothman Institute of Thomas Jefferson University. Fenlin performs torn rotator cuff surgery, and even shoulder replacements, for patients who may have over-stressed these joints through frequent push-ups. Fenlin recommends never performing a bodyweight exercise such as a push-up to the point of failure; stop before you reach your limit, and let your body rest before your muscles weaken to the point of instability. "I recommend 20 reps in perfect form," said Fenlin, in an interview with The Philadelphia Inquirer. 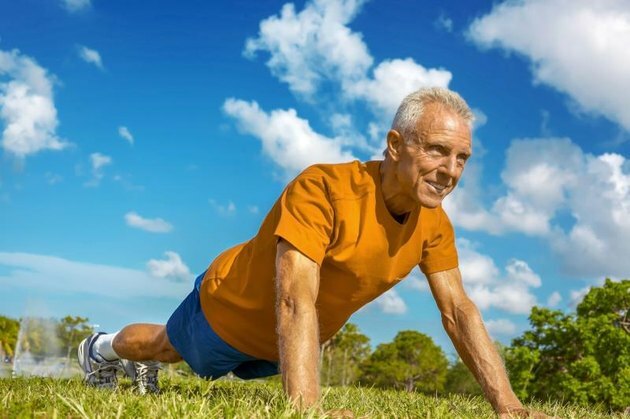 Like the fitness tests show, age is one of the major determinations for the correct number of push-ups in your routine. If you're an individual in your 20s and you're relatively fit, push-ups aren't dangerous, and you are unlikely to harm your joints. For middle-aged people, the level of risk goes up. "A push-up is a complex movement for the shoulder joint," says Fenlin. "Once you reach age 40, you should never work to failure. You should strive instead for perfect form." A perfect push-up starts with your hands placed in line with your shoulders -- too wide, and you could risk an injury. Tighten your abdominals, lower back and rear, and pull your kneecaps toward your hips, turning your entire body into one long plank. Lower your body until your chest is a few inches above the floor. Then, press up and return to the starting position. With good hand position, you won't be putting extra strain on your shoulders. How Many Push-Ups Should a 14-Year-Old Do? Does the Perfect Pushup Really Give You Results? What Are the Benefits of Push-Ups?